The other day I came across a book at work called "One Thousand Buildings of London," featuring tidbits about architecturally and culturally significant structures throughout the city. I looked up the area where Dave and I live. As it turns out, our immediate neighborhood apparently doesn't include much of interest -- at least to the authors. But they did list quite a few buildings in nearby Hampstead, including this entire street which Olga and I walk every time we go to the Heath. 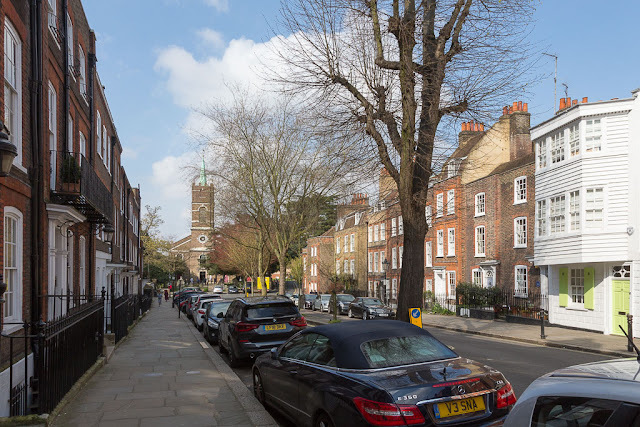 "This is one of Hampstead's most beautiful streets," the book says. "It is tree-lined in the center and bordered by redbrick-faced, double-story houses that have changed little over the years. There is elegant wrought ironwork everywhere and neat Georgian sash windows." Famous residents included authors Wilkie Collins, H. G. Wells and George du Maurier, grandfather of the famous Daphne. "The daughter of William Makepeace Thackeray, Anne, also a resident, described it as 'an avenue of Dutch red-faced houses, leading demurely to the old church tower that stands guarding its graves in the flowery churchyard.'" I didn't know the street's history, and I walk it all the time. Coincidentally, as Olga and I came back from the Heath yesterday, we passed a little tour group with the guide offering up some of those same famous names -- as well as Lord Alfred Douglas, known in his youth as "Bosie," who famously led to the downfall of Oscar Wilde and who apparently also lived there. Olga, of course, isn't interested famous people. (Unless they're standing nearby and have treats.) She just sniffed her various curbside smells and rolled in the Heath grass. 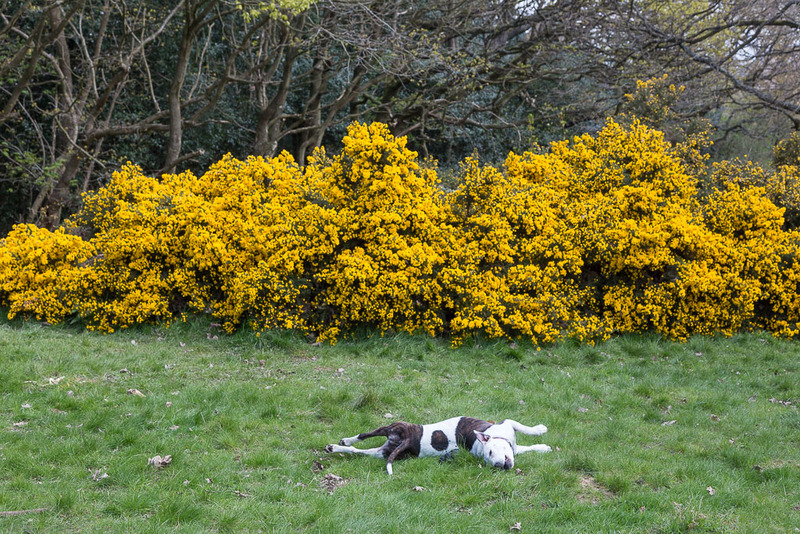 She was even oblivious to the brilliantly blooming gorse. 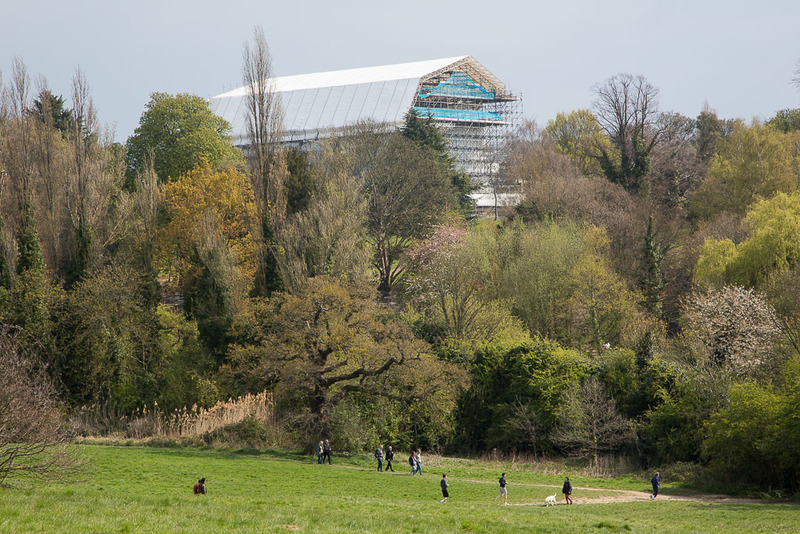 There's been a huge shed over Athlone House, a formerly derelict mansion on the northern edge of the Heath, for months and months now. It's supposedly being renovated by a Ukrainian billionaire, but I have no idea what the status of the project is. Olga and I found some amazing azaleas in the garden of Athlone House a couple of years ago, but when we checked on them yesterday they weren't blooming yet. Makes sense -- it is a little early. After we came home I did a bit more gardening -- put another plant in the ground, potted up my single cosmos seedling. (Well, I have two, but one is very decrepit and I suspect it's not going to make it.) I'm going to leave the empty cosmos seed tray just to see if any more grow. It's not impossible -- yesterday, two new honesty seedlings came up, more than a month after I planted them on March 9! I wonder how the anonymous Ukrainian became a billionaire. Maybe that's him lying on the log after receiving a dose of Novichok from a passing Russian agent. There are lots of them in London and the Novichok is supplied by someone called Kravitz who lives in a secret flat somewhere in West Hampstead. it always amazes me to see streets and houses in the UK and Europe with the front door right on the edge of the sidewalk or street if no sidewalk. no set back at all. so different from here. your seedlings might not have sprouted for many reasons, one being that perhaps the soil hasn't reached the warmth needed for the needed amount of time. just a thought. So I guess it's not just a fantasy that every street in London has its own history and fantastical stories to tell. At least that's how it always seems to me. Please let us know what that giant renovation project ends up looking like. Right now it looks like proof that some people have way more money than god intended. It's funny how we can walk by history every day and not know about it. I took one of those walking tours in Hampstead probably around 10 years ago and loved it. Our guide was an actress and she was very animated full of interesting stories. We saw the house used for exterior shots in Mary Poppins and we saw Boy George's mansion and where Pierce Brosnan lived and the street that Judy Dench lives on. We probably even walked up the street in your photo. I enjoyed that tour very much. I checked that link about the mansion. I can't even begin to imagine spending that kind of money. It makes me wonder why he's not building a home in Ukraine. I bet I can guess why. It is so interesting to learn about the history of places where you walk regularly. If buildings could talk, oh the stories we would hear. Love that photo of the man on the log. Yes, the sun does entice like that. When I lived in Seattle, and the sun would finally appear, there were many sun drunk people. Some winters were more awful than others, and we all wanted the sun to come back! London itself is a literary city. I read so much literature in my youth set there. I've seen the same sun-drunk reactions in New York's Central Park as well. Actually I've only seen photos or videos of the people sunning themselves. Here in Arizona we're used to the sun so its daily appearance doesn't stun us. More likely a rainy day does that after a long dry spell. ha-ha Olga, dog delightful! 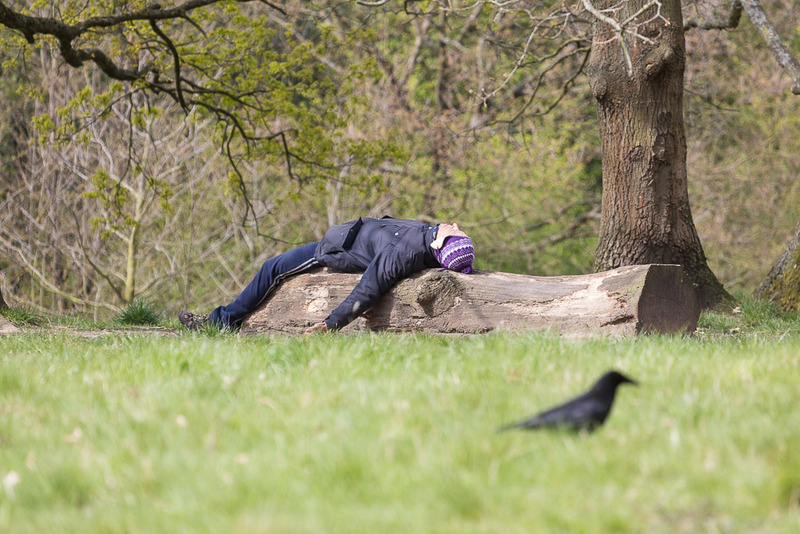 and that guy passed out on a log in the sunshine! It is a great day! I love your neighborhood, somethings seem stable and dependable there- or maybe it is just you and Dave and Olga. Anyway, Very nice feeling on that street! Olga looks sooooo happy - how sweet! I know I read and watch too many mysteries, but I probably would have checked if that man was alive. I love your dog..Such ja joyous creature! Nice to see Olga enjoying her outing. Lots of my seeds are germinating but it has been a very slow process but like you I shall wait. Gardening is not a pastime for the impatient! I am also intrigued by the Ukrainian person and Athlone House do keep us posted if you find out more.we are getting sunshine here in the Midlands but cold wind and some night frost so I bring my seed trays in at night.Lovely blog many thanks.